When you or a family member make the decision to seek supportive care in a residential setting, a continuing care retirement community (CCRC) may meet your needs. CCRCs offer health care along with a variety of services, amenities and social activities in a single community. As your health needs change, you’ll have access to increasing levels of care. With the option to remain within one community, CCRCs provide enhanced comfort, convenience and support. Before you choose a community, it’s helpful to gain a better understanding of how they work. To assist with your research, we’ve compiled some common questions and answers. Why Should I Consider a Move to a CCRC? CCRCs provide residents with the convenience of a variety of amenities and supportive services — along with health care if and when it is needed — within a single campus. Individuals can transition easily from one residential environment to another while remaining in familiar surroundings, and family members can feel confident about their relative’s care without the need to locate new housing. Individuals choose to move to CCRCs for a variety of reasons. In some cases, they want to relieve family members of worry and the responsibilities of caregiving. In others, individuals have lost a spouse and wish for the companionship and security that CCRCs offer. For many people, the low-maintenance lifestyle serves as the main attraction; with no yard work or household chores to worry about, residents can spend their time building relationships and engaging in activities they enjoy. Additionally, they know that if they should need additional support in the future, they can get it within their familiar community and surroundings. CCRCs, sometimes referred to as life care retirement communities, offer several levels of support to meet a variety of health needs. Communities typically offer independent living, assisted living, skilled nursing and rehabilitation within one campus. Residents may transfer from one level of living to another as they encounter changing health needs. With the full continuum of care available within one campus, individuals can continue to enjoy familiar surroundings and experience the least possible disruption to their lives as they gain access to additional care. Many individuals move to CCRCs as residents of independent living, which is ideal for those who can continue to live on their own but can benefit from a range of amenities and supportive services such as housekeeping, maintenance and transportation. Assisted living provides help for personal care tasks such as bathing, dressing and taking medications, along with the same range of convenient services and amenities as in independent living. Skilled nursing provides personalized health care for individuals who require long-term, continual medical monitoring, and rehabilitation provides temporary support following an injury, illness or hospital stay. What Are the Contract Types? Fee for service – In a fee-for-service community, residents pay an entrance fee that may be lower than with other contract types, but residents pay higher rates when they need additional levels of care such as assisted living or skilled nursing. In addition, certain services and amenities may incur additional charges above the basic monthly fee. Life care – Under this contract type, also referred to as an extended contract, residents may receive unlimited access to services and care including assisted living and skilled nursing without incurring additional charges. Modified Contract – A modified contract may offer a combination of both of the other types of contracts, with services provided for a specified time period at a fixed rate and additional services provided with higher fees. What Services and Amenities Can I Expect? CCRCs offer a wide array of services, amenities and programs to make life more convenient, social and enjoyable. In independent living, residents can take advantage of services like local transportation, maintenance and security, and chef-prepared meals. A full calendar of activities provides multiple opportunities for social engagement, learning, cultural enrichment and fun. Residents also experience a welcoming, elegant environment in CCRCs, with a variety of amenities that may include an art studio, bank, multiple dining venues, game room, gift shop, hair salon, guest accommodations, coffee shop, indoor pool and spa, fitness center, library, tennis courts, art galleries and more. Residents of assisted living and skilled nursing also experience inviting environments with an array of amenities. In addition, residents of assisted living have access to personal care services, including assistance with daily activities like bathing, dressing, eating and taking medications. Skilled nursing residents have access to personal care assistance along with medical monitoring and services. Accreditation is a type of quality certification that some CCRCs seek. The independent accrediting body, the Continuing Care Accreditation Commission, provides standards and best practices for corporate accountability, financial management and other areas. The ongoing nature of the accreditation process demonstrates a community’s commitment to upholding high standards of quality and continuously seeking to improve. The commission, the only accrediting body for CCRCs in the nation, imposes a strict process for granting accreditation. The commission reviews every aspect of a community, including services, residences, management, amenities and long-term financial outlook. Only approximately 350 CCRCs— out of thousands across the country — have received the commission’s “seal of approval” as an indicator of quality. What Are the Fee Requirements? Fees for entering a CCRC can vary significantly nationwide, depending on location, amenities, services, levels of care offered, and other factors. Communities may offer different payment options depending on contract type and level of care entered. Life care communities typically require the highest initial fee to enter the community, but fees typically do not rise as much as with other contract types when an individual moves to a higher level of care. Fee-for-service communities may offer a lower initial entrance fee, but costs can rise more than in a Life Care community with a move to a different residential option within the community. Some communities offer all-inclusive monthly fees that cover most or all of the services and amenities provided, while others use a-la-carte pricing to let residents pick and choose the services they prefer. If you or a relative believe a move to a CCRC will benefit you, reviewing the contract will allow you to understand the specifics of a community’s fees along with services and amenities, health care coverage provided, conditions for transferring to other residential options within the community, and the policy on cancellations and refunds. 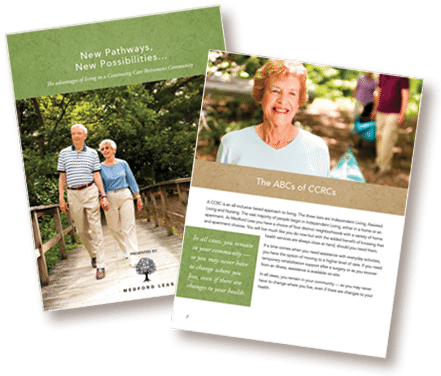 How Can I Choose the Right CCRC for Me? CCRCs offer an array of options for amenities, services, activities, medical care, residences and contract types. Choosing the right community can seem overwhelming. While you can gather significant information online, the best way to gain a comprehensive understanding is by visiting the communities that interest you. By meeting with a representative and taking a tour, you can learn about the various residential options, contract details, entrance requirements and more. Make sure you understand the process for transitioning to a different residential option, and review the community’s financial and licensing reports. In addition, allow enough time for a complete tour of the community, including the various residence types, dining rooms, and amenities like the fitness center and art studio. Medford Leas is a fully accredited, CCRC with two campuses in Medford and Lumberton, New Jersey. The heart of our 168-acre Medford campus is nestled within The Barton Arboretum and Nature Preserve and offers an inviting lifestyle in a scenic setting. We invite you to come by to experience our woodlands, streams, trails, wildflower meadows and more firsthand. To plan your visit, please contact us today.